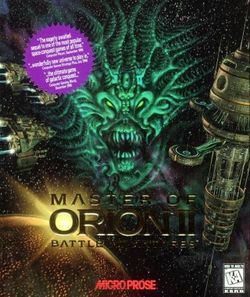 Master of Orion II: Battle at Antares (a.k.a. Master of Orion 2 and MOO2) was the first sequel to Master of Orion. Like the original, it was developed by Simtex; Steve Barcia and Ken Burd designed it. The Windows 95 and MS-DOS versions of the game (both on one disc) were published by Microprose in November 1996, while the Apple Macintosh version was published almost a year later by MacSoft. It is now hard to find CDs of the game, but the PC version is still sold as a combination download that includes Master of Orion. The DOS version is also sold as download. This page was last edited on 21 January 2019, at 13:26. This page has been accessed 258,253 times.